The Bryan Stow Foundation was founded out of survival, hope, courage, and triumph over tragedy. On March 31, 2011, a senseless, brutal attack following a baseball game nearly took his life. 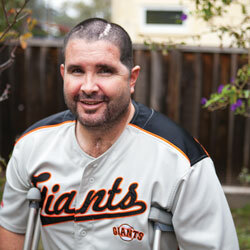 Bryan Stow is now on a mission to help communities put an end to bullying and fan violence. Bryan used to save lives as a paramedic; now his mission is to save lives by telling his story within communities, hoping his tragedy will lead people — young and old — to live kinder lives. Bryan will never fully recover from his injuries; however, with the help of his family and friends, he is able to present his story and guide this country’s youth to live bully-free lives as well as empower them to stand up and change a rapidly growing problem within our society. Feel free to browse the website to learn more about Bryan’s story. To schedule a presentation or a visit at an assembly, visit our presentations and assemblies page. For any questions, please contact us.